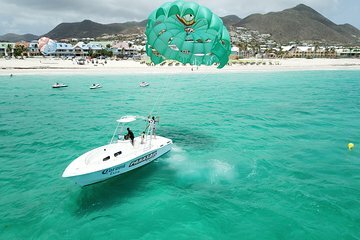 Parasailing over Orient Bay is an outdoor adventure that presents views from 300 feet (91 meters) in the air. Discover the island paradise of Sint Maarten from Bikini Beach, one of the Caribbean’s most beautiful shorelines. The boat crew ensures a safe and smooth 12- to 15-minute ride in the sky.